Staff was courteous and respectful. My daughter forgot her pillows and staff were able to locate them. They notified me ASAP. Where to find Merrimack hotels near an airport? Where can I find hotels in Merrimack that are near tourist attractions? Heading to Merrimack? There's a wide selection of apartments and hotels for travelers to choose from. Spend some time checking out our 20 hotel listings, which are all within a 0.1-kilometre (0.06-mile) radius of central Merrimack. Accommodations that are within easy driving distance to the city center of Merrimack include the Residences at Daniel Webster and Holiday Inn Express & Suites Merrimack. Merrimack features just a handful of economical accommodation options. You will find the Quality Inn situated 4 kilometres (3 miles) from the downtown area. The Stonehedge Hotel and Spa can be found 25 kilometres (15 miles) from downtown Merrimack. Another option is the The Bedford Village Inn, which is positioned 10 kilometres (6 miles) away. The Crowne Plaza Nashua and also the Hilton Garden Inn Manchester Downtown are some other Expedia-listed accommodations around Merrimack. For those who'd like to see more of the valleys in this region of United States of America, you may choose to plan extra days in other parts of Southern New Hampshire. Whether you enjoy common activities, such as hiking, horse riding and shore fishing, or just travel around to explore the attractions, you will be able to book suitable hotel accommodation in the vicinity. Nashua is 12 kilometres (7 miles) to the south of Merrimack and is where you'll find Pheasant Lane Mall and Daniel Webster College. 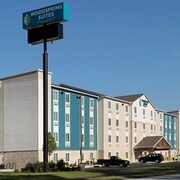 Nashua hotel options are the Courtyard by Marriott Nashua and Holiday Inn Hotel & Suites Nashua. Alternatively, you could consider staying at Concord, 40 kilometres (24 miles) to the north of Merrimack, where you'll find the The Centennial and Residence Inn by Marriott Concord. The Capitol Center for the Arts and Christa McAuliffe Planetarium are a couple of the popular sites to check out while in Concord. Before your Merrimack trip draws to a close, why not spend an afternoon cheering along with Manchester sports fans at a local match. Fenway Park is 65 kilometres (41 miles) to the southeast of Merrimack. Book a hotel near the action at the Mandarin Oriental Boston or the Four Seasons Hotel Boston. Manchester-Boston Regional Airport is a logical airport, and is 8 kilometres (5 miles) from Merrimack. Hotels that are nearby are Homewood Suites by Hilton Manchester/Airport and Holiday Inn Manchester Airport. 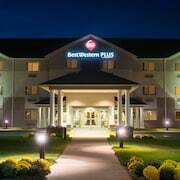 What are the most popular Merrimack hotels? Are there hotels in other cities near Merrimack? What other types of accommodations are available in Merrimack? Explore Merrimack with Expedia.ca’s Travel Guides to find the best flights, cars, holiday packages and more!